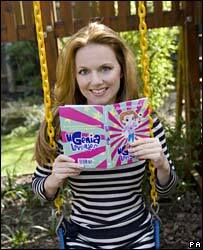 Former Spice Girl star Geri Halliwell has signed a six-book deal with a children's publishing house. The 34-year-old started writing when she became pregnant with her daughter Bluebell Madonna. She says writing about the book's heroine - nine-year-old Ugenia Lavender - is like an "adventure". 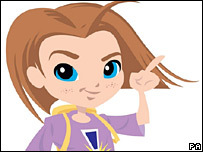 Halliwell also revealed how she has based one of her characters on former bandmate Victoria Beckham, who in the book is called Princess Posh Vatoria. Beckham gave Halliwell permission to use her as inspiration, as did celebrity chef Gordon Ramsey, who has been re-invented as Uncle Gordon. "I've only cast people in the book if it's authentic to the story. I don't know if the other Spice Girls will be in there," Halliwell said. She adds that all Ugenia's friends and family are "well-rounded misfits". "The characters I've built around her are both flawed and inspirational - just like us." Emma Hopkin, from Macmillan Children's Books, believes Halliwell's books will "engage with young boys and girls everywhere". Halliwell follows in the steps of Sir Paul McCartney and Madonna who have both penned books for children.